Today I'm going to share something with you that I wish someone had shared with me a long time ago - the rules for entering writing competitions. Writing competitions are fun, sometimes disappointing but occasionally rewarding. Some competitions - unfortunately not many - give you feedback. Faithfully, you follow the entry guidelines, pay your $$ and cross your fingers. Usually you'll only hear something back if you're one of the winners. I've been fortunate in that I've been a winner several times - and it's exciting - but you never get to know why you're a winner, what criterion was your entry assessed on. Perhaps more importantly, for the many, many competitions that I and others enter, for which we hear nothing back at all, it would be helpful to know why our entries were not successful. So, in the interests in writers everywhere, I'm going to do the big reveal! Recently I've been working as a volunteer judge for an Australian writing competition and, can I tell you, looking at the world of literary competition is entirely different from the other side of the page. Of course you expect you're going to be judged on the mechanics of writing, but I didn't realise how stringently. I - perhaps naively - thought it was all about telling a good story with appropriate attention to punctuation, spelling and grammar. And it is, but it is also so much more. Genre or sub-genre - was the entry suitable for the genre targetted? Did you care what happened to the characters? Were questions raised you wanted to see resolved? Entry is ready for submission to publisher/editor? So there we are. That's the list. Now, if you're writing something that you intend to enter into a writing competition or to a literary agent, publisher, editor etc, you could do worse than follow this list. Naturally when you write, you think you're doing all of this, but in reality, are you? It's sometimes hard to step back and be objective - you're too close to it. As an aside, while judging the entries, I was regularly disappointed by how few entrants seemed to understand basic grammatical functions; it's a sad comment about the standards of education in this country. Regular readers of this page will know how I like to bang on about writing mechanics. I cannot stress enough: don't assume you understand redundant apostrophes, adverbs, tautologies, oxy-morons etc. Make sure you do! 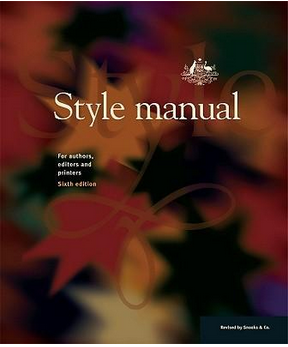 Australian, British writers should get their hands on a Style Manual specific to our version of the English language. For my American friends, your go-to is the Chicago Manual of Style. They have an online version too! Now, if you are planning to enter a competition, Opportunities for Writers regularly lists various competitions from all around the world.